The Earth as seen from the moon on June 12, 2010 is the subject of this photo from NASA's Lunar Reconnaissance Orbiter, a mosaic taken during a calibration sequence. Full Story. An eye-catching new view of Earth has been caught oncamera by an American spacecraft circling the moon. The new photo of Earth was taken from a distance of 231,358miles (372,335 km) by NASA's unmanned Lunar Reconnaissance Orbiter during aroutine camera test as the probe orbited around the moon. 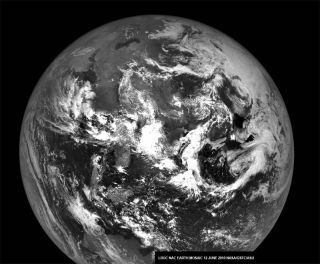 The black-and-whitesnapshot catches Earth's portrait as it appeared on June 12. "It wasa beautiful clear summer day over the North Pole, you can see ice covering mostof the Arctic Ocean with a few leads of open water (dark) starting to openup," wrote Mark Robinson, ?principal investigator for the powerful LunarReconnaissance Orbiter Camera (LROC) at Arizona State University, after postingthe photo Thursday. The image isactually a mosaic of photos taken by the lunar camera as it panned across theplanet. One swirling rock formation can be seen running through parts of Iran,Afghanistan and Pakistan, Robinson wrote. NASAlaunched the LunarReconnaissance Orbiter in June 2009 to seek out potential landing sites onthe lunar surface for future missions, as well as hunt for signs of water ice. Sofar, the orbiter has found NASA's past Apollo moon landing sites and evidenceof wateron the moon (the latter with the help if its partner probe LCROSS ? whichcrashed into the moon last year while the orbiter watched ? and other probes). But everynow and then, mission scientists have to point the orbiter's LROC camera systemat the Earth for calibration sessions. The moon's subtlecolor changes make it a poor target to measure scattered light, Robinsonexplained. The Earth is a bright target against the ultra dark background ofblack space, so any image anomalies caused by scattered light (light reflectingoff internal parts of the camera) are easily measured, he added. "Fromthe moon, the Earth serves that function well," Robinson wrote. Thesecalibration sessions allow scientists to fine-tune the Lunar ReconnaissanceOrbiter's seven-color wide angle camera in order to account for scattered lighteffects in its photos. While the wide angle camera is being calibrated, theorbiter's narrow angle camera is free to snap photos of Earthfrom space. "Imagine standing on the moon looking back at theEarth!" Robinson wrote. "When humans start to live and work on thenearside of the moon, they will have a constant, spectacular view of our homeplanet." Until then, he added, the people of Earth will have tosettle for photos from robots.